Who is it for? Sugar Scarlet Starlet Smudge Me not Liquid Lipstick 29 is a bold orange-based red that suits all skin tones. It can be a great summer red for your holidays or festivities. This liquid lipstick comes in a transparent plastic tube. Its lid has an applicator brush which applies the lip color perfectly. Scarlet Starlet is a warm red shade with orange tones. The shade is extremely bold and but not neonish. It complements yellow based neutral undertones pretty well so this is a great shade of red for Indian skin tones. It is a light liquid; not too thick or uncomfortable. It dries quickly so you need a quick hand for applying. You need to be precise as well otherwise it would take a lot of effort to correct the mistake. Pigmentation is superb; no patchiness and completely opaque finish in a single stroke. It has a light berry fragrance. The fragrance does not stay long so no annoyance involved! Orange toned red lip colors are my all time favorites. That’s the reason I went for this bold lip color in spite of knowing I would probably use this only occasionally. Now, the shade is quite bold but it complements most of my traditional attires with heavy zari work. I have worn it on both daytime functions as well as on nighttime events. Its vibrant orange tone instantly brightens the face and brings lively jive to the entire makeup look. Overall the shade is wot=rth a try for all red lip lovers. What do I like about this liquid lipstick? What I dislike about this liquid lipstick? It is a warm red that I love very much. So, I am definitely buying the full size. I will highly recommend this to all who are looking for a bold red. 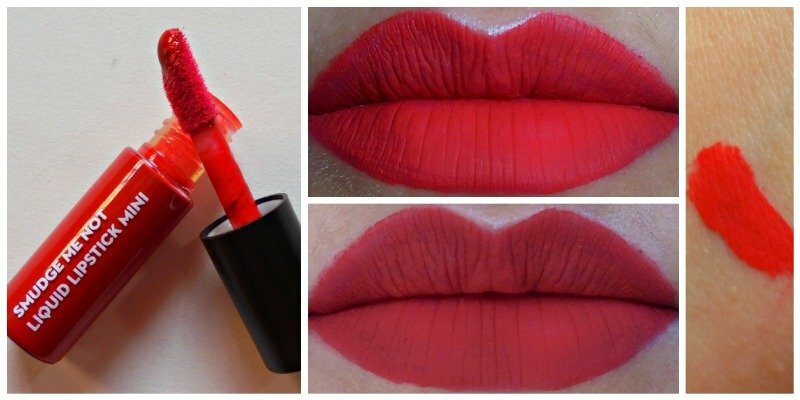 If you shy away from orange lipsticks but are comfortable with red lippies then do try this one.